- Amazon stock surges 17% as earnings beat expectations. - WTI was 7/24 at $48.14 and Crude Oil $52.62. Oil prices continues its rapid decline. - Anthem to buy Cigna for $54 billion, creating nation's largest insurer. - US new home sales at seven-month low; manufacturing stabilizes. - AT&T gets FCC approval, immediately completes $49-billion takeover of DirecTV. 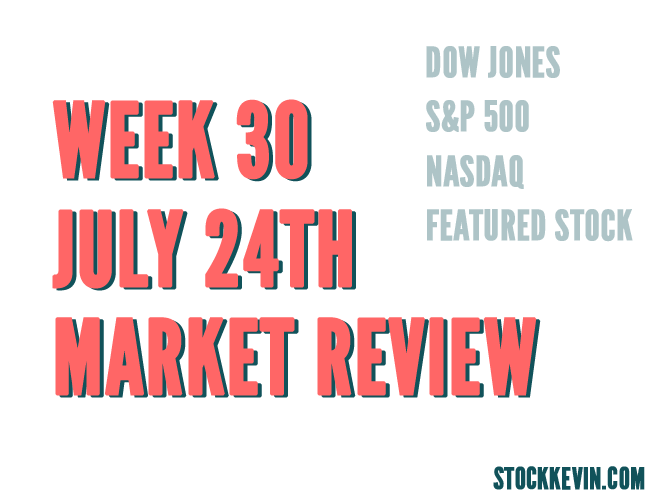 The Dow Jones Industrial Average (DJIA) closed at 17568.53 on Friday, July 24 2015, which was about a 517 point decline versus a week ago of 18086.45 on Friday, July 17 2015. We've seen the market try and retest the top, but it ran out of momentum at 18100 and was quickly sold. Four consecutive red days after a bullish run is not a good sign for bulls. We continue to be in a wicked trading range beginning in March. There will most probably be another retest of the bottom of the range. This time it might not be so friendly. The previous bounce was a hard fought bounce. Would not be surprised if we actually broke below this range this time. The S&P 500 closed at 2079.65 on Friday, July 24th 2015 versus a week ago of 2126.64 on Friday, July 17th 2015. This was a 47 point swing downward. 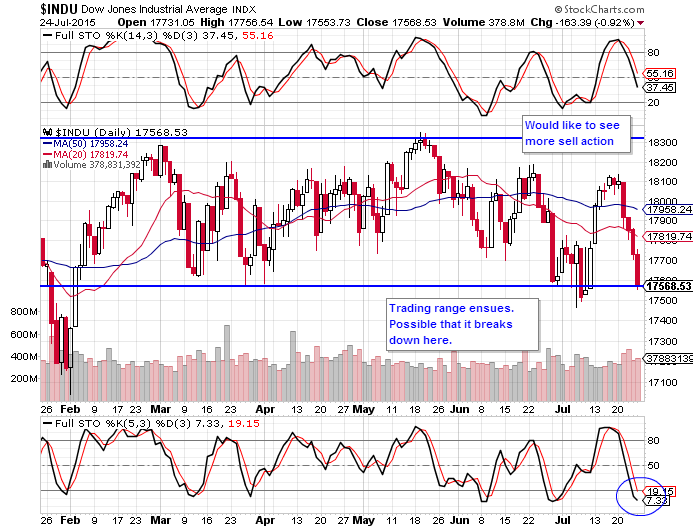 While this chart is a bit stronger than the DJIA, we still see that it is definitely in a trading range. I'd expect to see a retest of the bottom range as we are not yet oversold. For the bulls any trade at the bottom of the range with a tight stop is good risk to reward. Any break below the trading range then I suggest you go short. The Nasdaq (COMPQ) closed at 5088.63 on July 24th, 2015 versus 5210.14 on July 17th, 2015 . 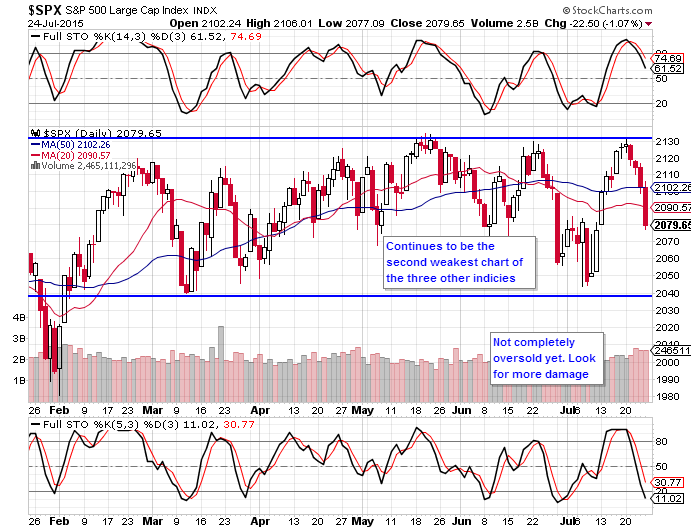 The strongest of the three indices is still the COMPQ. We noticed that the indicators still show that it is not yet oversold and that we have yet to retest the 50 or 20 DMA, which means that the trading trend is intact. The stocks in the Nasdaq include but are not limited to Google, Facebook, eBay, Dish Network, Costco, Amazon, and Apple. So you can see why the Nasdaq is still above water. The past few weeks, Amazon and Google have performed relatively better than its peers. Shake Shack is a modern day 'roadside' burger stand serving the most delicious burgers, fries, hot dogs, frozen custard, beer, wine and more! We've covered Shake Shack in the past before. 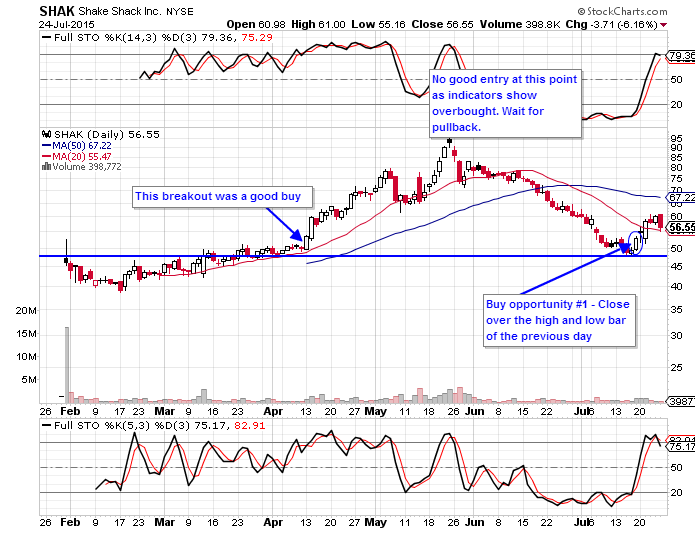 There were two very good buy opportunities that we were not able to take advantage of as we were in FIT. 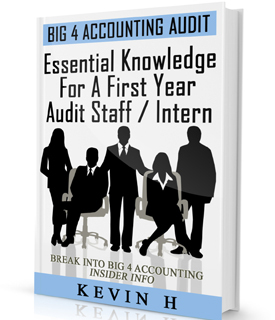 In any event, the first occurred early April and then again in early July. We saw selling action from Jun through mid July as the price reached about $96. The second opportunity was a the close of the high and low bar of the previous day. The stop would've been right where the blue line is. If I held the position today, I would put my stop at the 20 DMA. 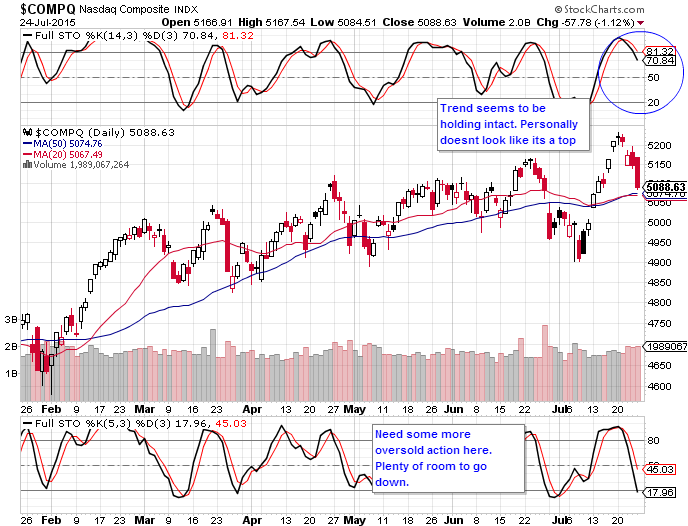 Though it is likely that it will break through that as indicators show it is overbought. Disclosure: I do not have a position in SHAK.